Panthera Colombia works to ensure the long-term survival of the jaguar and its associated biodiversity through the Jaguar Corridor Initiative. 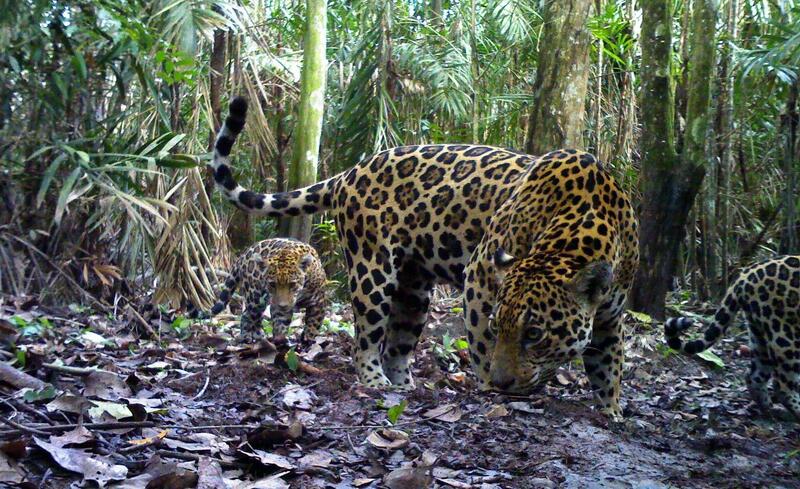 This Initiative encompasses not just the connectivity of jaguars at a large scale including unprotected areas and human productive landscapes, but addresses connectivity of forest and watershed protection that buffers climate change impacts on the entire country. At a finer scale it devises and applies Agro and Livestock best practices joined-up that ultimately bring win-win results for local producers and the environment. Panthera Colombia ensures the best partners for the job and the region by closely collaborating with Government Institutions and fellow scientists in general, and local NGOs, campesino, indigenous groups, and private landowners in particular. The Jaguar Corridor Initiative has been formally recognized by the government for the last nine years as a tool to meet post Rio Conservation Diversity Targets for the country and another measures of protection for forests and rivers. Our conservation actions are driven by science and impact zoning and development planning for the country, strengthening the governance and operation in National Parks, promoting best practices in Agro and Livestock production in development frontiers, and basic conservation knowledge of jaguars and their prey in key habitats in need of protection. Panthera’s work largely focuses on natural areas that are inhabited, like the Magdalena Medio, Bajo Cauca and the North of the Orinoquia in Colombia, where the success of our conservation programs depends on relationships with remote and marginalized rural communities. The most important current key action is to ensure the creation of a new park, Serranía de San Lucas National Park. This park will not only enable jaguar connectivity between west and east of Colombia in the Jaguar Corridor, but will provide clean water to tens of thousands of people living in the Serranía de San Lucas and the communities that depend on those headwaters in the Depresión Momposina lowlands. We are also tackling one of the most significant threats to jaguars. Jaguars sometimes eat cows, and livestock owners then react killing jaguars. We have found the solution to this human – jaguar conflict through better livestock management and husbandry practices. Throughout our 30 depredation limiting model ranches we show, ranchers large and small (poor campesinos are understandably the least tolerant to livestock losses), how to coexist with jaguars and at the same time have a more productive cattle system. The implementation of these ranches and the training on local environmental corporations throughout Colombia is done through our conflict reaction team called GRECO (acronym following the Spanish name of the team: Grupo de Respuesta al Conflicto con Carnívoros). As apex predators, jaguars shape the landscapes they inhabit, protecting the food web, structure, and baseline ecological processes on which their habitats depend. Scientists have only recently begun to understand the vital role played by jaguars—exerting control over smaller predators, prey, plants, and disease—in ecosystems and the profound impacts on habitats and food webs. The disappearance of large predators like jaguars in ecosystems, menace the very systems that produce food and hold human and zoonotic diseases in abeyance. The loss of the jaguars and large predators constitutes one of human development’s most pervasive influences on the environment—an effective decapitation of the trophic systems that support biodiversity in ecosystems. Jaguars survive today even in the face of human development, having lost more than 50% of their home range due to habitat loss and fragmentation from mining, infrastructure, and agriculture. They will continue to endure if the human communities who share their landscapes can make strategic decisions on land and water use that accounts for jaguars and biodiversity.